The title of this review says it all. But if you’re looking for a “feel good” movie that makes you all warm and fuzzy and settled inside, this is not the movie for you. But if you’re interested in seeing one of America’s greatest living actors give a stellar performance, playing, not as in the past, the suffering hero (Man on Fire) or a complete scum bag (Training Day), someone approaching an ordinary human being cast into an extraordinary situation, well then, this movie’s for you. 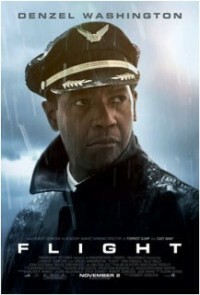 Denzel Washington will be nominated for another academy award for best actor due to his great performance in this film. But the actor who steals every scene he’s in (though he’s on screen for only a few minutes in total) is John Goodman, the drug dealing, fast talking, conspiracy theory side kick to Washington’s pilot character, Whip Whitaker. Think Johnny Fever on cocaine with a beer belly and you’ve got Goodman’s role in this film pretty much figured out, though the big man makes taking drugs as therapy for the human condition almost, well, joyful. The first five minutes of the film, we see a very lovely Nadine Velazquez (in the guise of flight attendant Katerina Marquez) in the all together after a night of binging and coke sniffing with Whitaker. For my three sons and I (we all booked from the house while my wife and daughter-in-law had some sort of bag and clothing sale going on involving cheese, wine, and the spending of money on a rainy Saturday afternoon) that was a bit of a distraction. But a pleasant one, I’ll assure you. And then the roller coaster that is Whip Whitaker’s shattered life begins. And what a ride it is. Bruce Greenwood plays the union representative of Whip’s pilots’ union with steadfast thoroughness and Don Cheadle (himself an Oscar winner for Hotel Rwanda) is admirably able as the union lawyer who, after Whip successfully lands a poorly maintained jet liner and saves over 90 souls, tries to protect Whip’s career (seems that flying at a .24 is as frowned upon as driving in that condition; never mind the cocaine in Whip’s system). In addition, the love story between two wrecked human beings (Whip and a mainlining heroin junkie played with great skill by Kelly Riley) is satisfying and has the ring of realism as the two negotiate a path between self-destruction and healing. All in all, a fine film.